Does High Ball Flight Hurt at the British Open? During the coverage of The Open Championship on ESPN I’ve heard numerous references to how a high ball flight hurts a golfer (because it exposes the ball to the wind longer) or how golfers have to adjust their ball flight lower to avoid the wind. The conventional wisdom certainly makes sense here, but I’ve never actually looked at it. If it does make a significant difference then guys like McIlroy, Fowler, Jason Day, Stenson, etc. who bomb it high would either have to adjust their games or suffer the penalty. 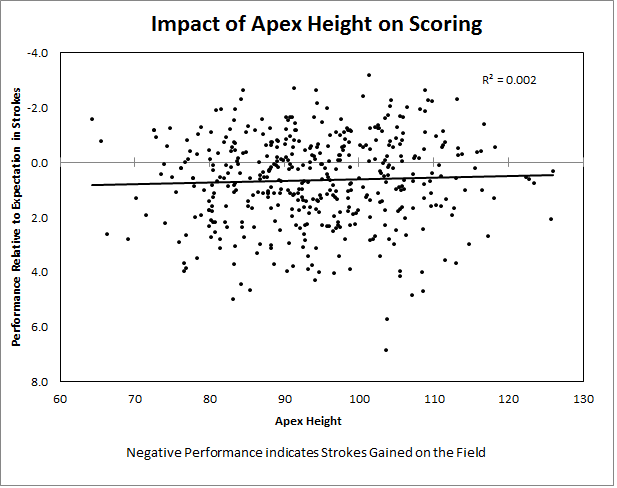 To test whether this is actually happening I’ve taken the PGA Tour’s posted Trackman data on Apex Height and used the results of the past six Open Championships to measure whether there is any connection. 1. That a golfer’s ball flight with their driver, woods, irons, etc. is represented by their Trackman Apex Height measured only on drives. My limited knowledge of projectile physics and golf confirms this is likely true. 2. That a golfer is hurt by either 1. high ball flight or 2. adjusting their game away from normal high ball flight. It may be that high ball flight harms golfers at The Open, but golfers easily compensate for it without harming their ability. It seems unlikely, but keep in mind I’m not compensating for whether golfers play differently at The Open. The PGA Tour has radar measurements since 2007. My Apex Height for each golfer is simply their average of the two prior seasons (or one prior season if they have only one). I’ve tossed out anyone without listed data; this removes most European Tour golfers. This is unfortunate, but there’s no data available (and it avoids confounding the results with any home continent advantage). To judge performance I simply compared each golfer’s performance relative to the field in that year’s Open Championship to what I expected from them entering the event, using my ratings up to the date that tournament was played. These ratings are heavily based on the previous couple of seasons of overall performance. This allows me to measure performance changes due to the impact of ball flight. A golfer who performs to expectation will receive credit for no change, while one that overperforms by a lot will be credited for overperforming. I’ve used Open Championship results from 2008-2013 because that’s when there is Trackman data available. First, ball flight is strongly correlated between seasons for golfers. Season N is correlated at R=0.77 to Season N-1 and R=0.68 to Season N-2. What Apex Height measures is definitely a persistent ability for golfers. It appears that a high ball flight does not impact performance in The Open Championship positively or negatively. This is based on 437 tournaments over 2008-2013. The results indicate there is no impact on performance, however some caveats are needed. 1. This assumes that the randomness of putting has washed out of the results. Golfers have hot or cold putting rounds all the time which are not impacted by ball flight at all, and I cannot be certain this hasn’t impacted the results. 2. This also assumes that weather effects have been distributed evenly. It seems unlikely that the high ball flight golfers have benefited from disproportionately calmer weather conditions, but weather is highly variable and the sample is only 437 golfer tournaments. Despite those caveats, I think it’s likely that either high ball flight doesn’t harm a golfer’s chances at The Open or that golfers can modify their ball flight at The Open without seeing any negative impacts on performance.